Of all the massacres perpetrated in Europe in the name of Islamic State, yesterday’s slaughter in the Ramblas has a particular personal resonance for me. I spent nine years in Barcelona, living near the Ramblas for part of that time. Even when I moved further away from downtown Barcelona, hardly a week went by in which I didn’t pass through it. This is because the Ramblas has a special place in the life of the Catalan capital. It’s where you go to meet people, at the Café Zurich at the top of the Ramblas, or by the entrance to the Plaza Catalunya station, or by any other point up and down this fabulous thoroughfare. It’s where you go to shop at the marvellous La Boqueria indoor market, or look at the fruit and vegetable stands laid out with meticulous precision in dazzling displays of colour. More than anything else, it’s a place you go to stroll. Lorca famously described the Ramblas as a street that was so beautiful that you didn’t want it to end, and he wasn’t wrong. 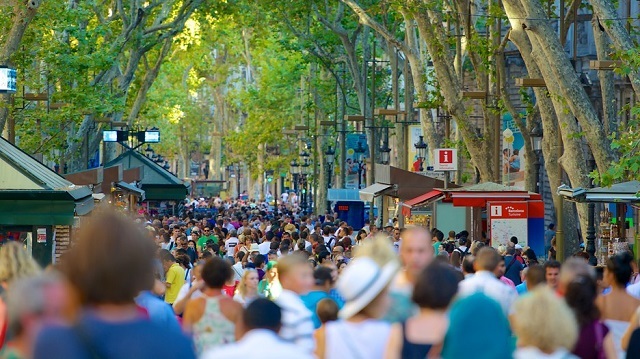 Despite the over-priced cafés, the dense thicket of tourists, the traffic running up and down alongside the pedestrian thoroughfare, the Ramblas remains a space of peace and beauty. On Sundays it was a pleasure to join the families walking up and down the rows of plane trees, past the flower-sellers, bird stalls, and newspaper stands, to check out the dancers, the ridiculously elaborate living statues, musicians, the skinny little guy who used to perform astounding tricks with a football, the silver-painted Columbus I once interviewed for a radio feature. Sometimes you might let yourself drift dreamily all the way down from the Plaza Catalunya to the Drassanes medieval shipyards; past the rebuilt Liceo opera house; the Miró mosaic where the murderer eventually crashed his van yesterday; past the Poliarama cinematograph where George Orwell spent three days reading detective novels in June 1937 while anarchists and Assault Guard soldiers shot it out in the Café Moka down below; past the seedy side-streets of the Barrio Chino, where Jean Genet had once picked up knife-fighting lovers in sleazy bars; past the former stamping ground of so many characters from Juan Marsé’s Barcelona novels; past doorways that still bore the marks of the high heels of prostitutes waiting for ships to arrive at the harbour. Every Catalan town or city has its own Ramblas, but none of them compared with this one. Even when the city walls were knocked down and the palatial Passeig de Gracia was built on the lines of a Parisian boulevard, the Ramblas was the street where people came to again and again. Because a walk down the Ramblas wasn’t like an ordinary walk. You nearly always slowed down, partly because there were so many people there; because there was so much life and colour to look at; because it never ceased to be a pleasure to hear the birds or watch the children timidly approach the wild-looking living statues to give them a coin and make them move. I walked through it in the spring and summer, just as it was yesterday, when the plane trees form a canopy that protects you from the heat and the humming and buzzing of thousands of voices seems louder; and also in the autumn and winter when the blue sky reminds you that even in the coldest months you are living in a great city that is part of Fernand Braudel’s common Mediterranean civilisation. The Ramblas was not just a street or an ‘artery’ but a forum. It was where Catalans went to celebrate when FC Barcelona won an important match, where George Orwell encountered for the first time a society where ‘the working class was in the saddle’ in 1936, where carnival passes every year, where city festivals and political demonstrations inevitably converge. None of this mattered to the ‘soldier of Islamic State’ who came to the Ramblas to murder dozens of strangers yesterday. Their lives had no meaning to him, except insofar as killing them could advance the political goals of Islamic State and its pitiful caliphate-of-the-dead. This was not the first time the Ramblas has been visited by terrorism. In the late nineteenth and early twentieth century, the street was at the epicentre of a bitterly-divided and unequal city, where aristocrats and businessmen, kings and generals rubbed shoulders with the poorest of the poor while coming and going from the Liceo Opera House. In 1893, the anarchist Santiago Salvador threw two Orsini bombs into the audience during a performance of Rossini’sWilliam Tell, one of which went off and killed twenty members of the audience. 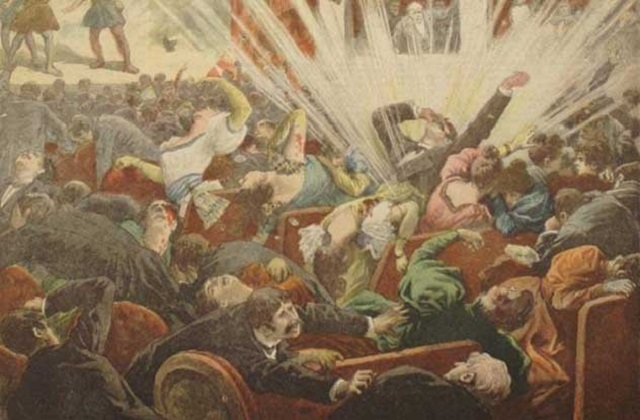 Artist’s impression of the 1893 anarchist bomb attack on Barcelona’s Liceu Opera House. which killed twenty members of the audience. In fact, the motives and perpetrators behind these bombings were often obscure. In 1908, it emerged that many of them were carried out by a police informant named Juan Rull, who worked for the sinister political police unit the Brigada Social. Assisted by his aging mother, who carried many of his devices in a bread basket, Rull set off bombs everywhere, or warned about bombs that he himself had planted. Some said that he did this to keep himself in employment; others that he did it to claim reward money for ‘saving’ the city from his own bombs. Though Rull confessed to these crimes before his execution, it was alleged that he was working on behalf of more obscure powerful political forces intent on undermining Catalan separatism by justifying a state of emergency. Few people who visit the Ramblas are likely to remember this dark and turbulent period in the city’s history. Now the city has been sucked into the 21st century’s own particular darkness, and the ‘motives’ behind yesterday’s monstrous crime almost certainly follow the same savage logic that Daesh and its cohorts have followed thus far. We can surely place it within the overall context of Daesh’s strategic assault on the ‘grey zone’ of coexistence between Muslims and Western societies; the ongoing collapse of its blood-stained Caliphate in Iraq and Syria; and the brutal reconquest of Mosul that has cost some 2,000 civilian lives. In truth, they murdered thirteen entirely innocent people in one of the greatest streets and one of the greatest cities in the world. All that is bad enough, but as always, the hatred is not limited to them. It’s only a few days since a car drove into anti-fascist protesters in Charlottesville, killing Heather Heyer, a young woman who the Nazi Stormer website called a ‘fat skank’. Within an hour of yesterday’s massacre, Twitter was teeming with gloating ‘I told you so’ messages attacking ‘leftists’, ‘normies’, ‘liberals’, ‘mass Islamic immigration’ and refugees, and professing to care about the victims. Some of them posted videos of dead and dying people on the Ramblas, so that we can ‘understand the situation we’re in’, and then shrieked about ‘censorship’ when twitter removed these videos. As you might expect, the sick creature and fascist enabler who calls himself president of the United States weighed in with observations that were obtuse and iniquitous even by his standards, even reviving the debunked myth that the Moro insurgency in the Philippines was stopped when General Pershing shot 49 out of 50 Muslim prisoners with pigs bullets. Such responses are as much a gift to Daesh as its massacres are to those who express these views. Each side needs the other, even as they increasingly resemble each other. Daesh does not carry out these massacres to be liked. It expects to be despised, but for such hatred to be politically useful, it wants it to be generalised. It wants Europe to become a hell of violence, hatred and intolerance, where Muslims are feared and despised to the point when they can no longer live there. Fortunately for them, the ‘alt-right’ and so many others are only too pleased to oblige them. They —and Daesh— would like to have a world without bystanders, where there are only two ‘armies’ fighting a ‘clash of civilisations’ that is increasingly becoming infused with undeclared notions of a religious/race war. If that happened, it would bring about the destruction of our world and the triumph of barbarism, and you would have to be blind, smug or complacent to dismiss such a possibility. That is why, once again, we must mourn this evil act and express our solidarity with the victims, and our contempt for the perpetrators, then resume the difficult search for a society such things cannot happen, where haters, extremists and fascistic reactionaries can have no place. And to do that, we must also look forward to a time when the Ramblas will come to life again, and people will walk through the plane trees and taste the sweetness of life, and children will once again step forward to place their coins and bring the living statues to life. And even in these heartless, bitter times, we must let these possibilities galvanise us to believe that a better future is possible.